PHOTO BY MARK CHAMBERLIN The baby kale salad. After the visits my wife and I made to Fiorella, one word stuck in my mind and defined almost everything about the restaurant: simplicity. Simplicity resonated through the entire experience, from start to finish. Walking through the door for dinner, the combination of the low lighting and the tastefully decorated white block walls gave some atmosphere without making the room imposingly dark. The Staach-designed chairs, tables, and benches brought contemporary, light wood designs that contrasted with the older aspects of the space. The simplicity carried over to the joyfully concise Italian menu, which features local and house-made ingredients. A focused menu is a great indicator that the restaurant doesn't overextend the kitchen's ability to store and create high-quality food. What struck me was that each dish had a relatively limited slate of ingredients, but it rarely felt like more would have made an improvement. Since Fiorella doesn't have a full liquor license, the only cocktail available was a wine-based Americano that toed the line between sweet and bitter. This played nicely within the confines of a restaurant serving only beer or wine. The delightful bread and butter ($3) was no more than a Flour City Bread baguette and salted butter. The texture of the bread and the cultured flavor from the butter stood out here. 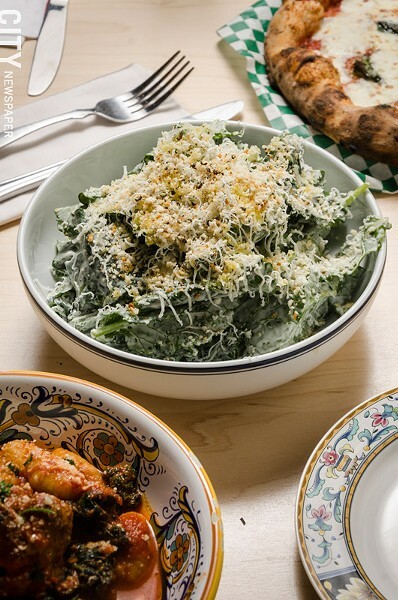 A baby kale salad ($7) was coated with a creamy cacio e pepe dressing that was savory without becoming overwhelming. The Bolton Farms greens weren't overdressed, and their delicate flavor worked well with the ground pepper, seasoned breadcrumbs, and plenty of grated Parmesan cheese. Fried brown rice with house-cured guanciale ($9) was a playful and satisfying take on the Chinese takeout favorite. The vegetables were diced small, the sunny-side egg popped on top, and the seasoning was subtle. The weekly gnocchi special ($20) was the epitome of less being more. Pillowy potato dumplings were bathed in a San Marzano tomato sauce and served with a meatball and sautéed greens. 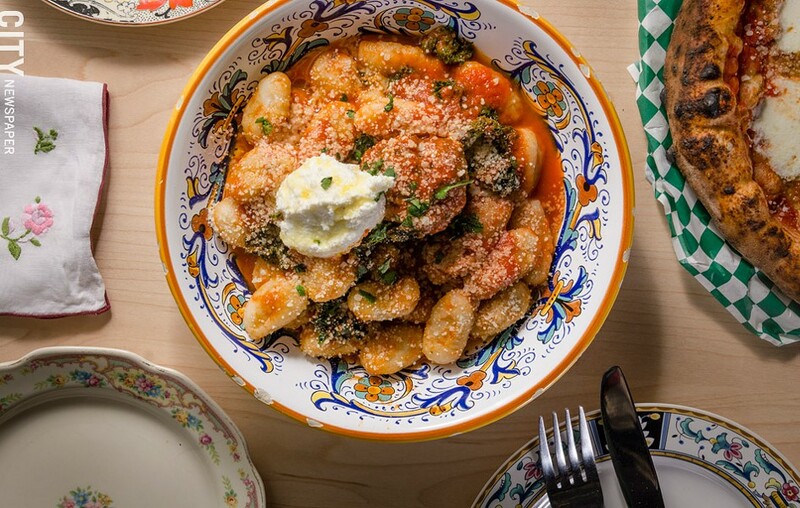 The balance with the ingredients eaten in one bite was striking: strong beef mixed with bright sauce, a touch of funk from the greens, and the creamy gnocchi. I was left shaking my head and smiling with how much I enjoyed the combination. The guanciale showed up again with the Roman style spaghetti ($16) along with softened onions and parmesan cheese. This was a heavier dish that needed something to brighten it up a bit. The texture of the pasta was notable in that it was made in house, and each piece was perfectly al dente. I'm looking forward to trying more pasta dishes to see how the other versions stand up. One of my food passions is Neapolitan style pizza, and Fiorella seriously stepped up to the plate with the Rosso pie ($13) that my wife and I shared. The well-seasoned crust had a puffy cornicione (outer crust) and a slightly crispy and chewy texture that can only be found with a wood-fired oven running at a very high temperature. The four-day natural fermentation (no added yeast) brought sourdough-like flavors into the crust and helped make this a fantastic Neapolitan pizza base. The toppings were a minor tweak on the Margherita that I use as a baseline for this style of pizza: San Marzano tomato sauce, fresh mozzarella, basil, oregano, olive oil, and some diced garlic. No issues there. If I'm being nitpicky, I'd prefer a touch more sauce, and I'd like to see the oven a few degrees higher to get some blisters on the cornicione, but that is more personal taste than anything else. This is a top-notch offering after only 6 months working with the oven, and I can't wait to get back for more. On the sweet side of things, the chocolate olive oil cake served with a citrus crema and a warm ganache would be a good option to satisfy the chocolate lover in your dining party. We enjoyed the chocolate and vanilla gelatos alongside a strawberry sorbetto each for different reasons. The chocolate was rich enough without being too dark, the vanilla bean flavor was more subtle but pleasant, and there was a concentrated hit of strawberry in the sorbet without being jelly-like. I finished off my experience with a vegan eggplant sandwich ($7.50) served on Flour City Bread that never felt like it was missing meat. 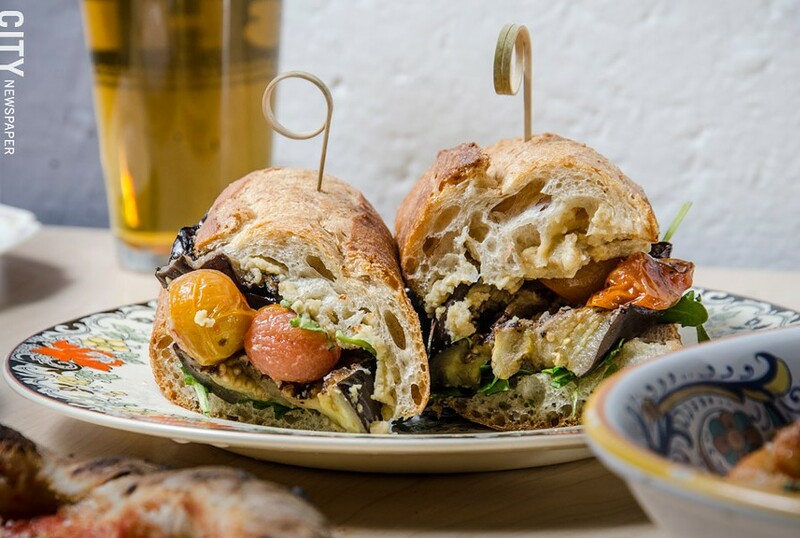 Roasted eggplant with a salty bean puree and some white balsamic-dressed tomatoes gave this plenty of depth of texture and flavor and provides a good reason to stop in for lunch while roaming around the Public Market.